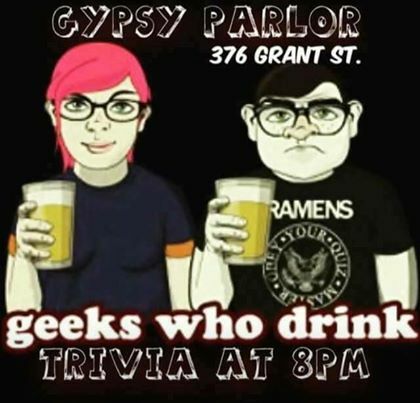 Every Monday join the Gypsies for trivia. Geeks Who Drink is a homegrown Pub Trivia Quiz. Grab a table and enjoy food and drinks off of our delicious menu. Our quizzes cover everything from celebrities in trouble to wordplay to bad television. Play in teams of up to six or by yourself if you’re some kind of savant. Winning teams gets street cred, Gift certificates and beer prizes. Bonus Questions for free pints are sprinkled throughout the quiz.You don’t have to be a trivia God to enjoy the quiz. Since you’re playing on a team, the collective knowledge base makes for more fun, less pressure. It’s not final friggin’ Jeopardy.